Stock photo of a bronze sculpture of caribous crossing a river, titled "Seal River Crossing" outside the Richardson Building with the Canwest Place building in the background, City of Winnipeg, Manitoba, Canada. Bronze sculpture of caribou crossing a river sits outside the Richardson Building in Winnipeg. 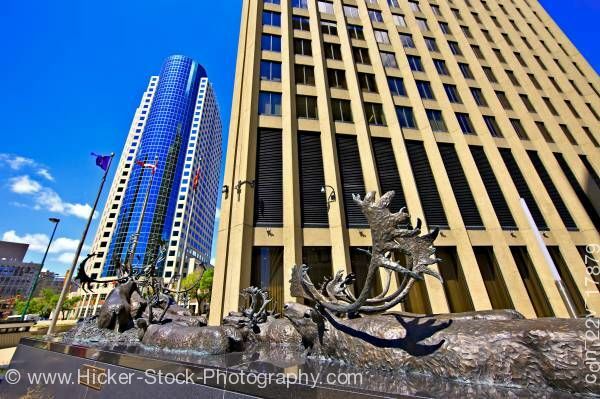 This stock photo shows a bronze sculpture of caribous crossing a river, titled "Seal River Crossing" outside the Richardson Building with the Canwest Place building in the background, City of Winnipeg, Manitoba, Canada. This amazingly detailed bronze sculpture of caribous crossing a river sits outside the Richardson Building. The sculpture has the caribou in the waters leading up an embankment. Large antlers adorn the caribou. The bronze sculpture is titled “Seal River Crossing”. The Richardson Building stands tall just behind the sculpture. Another glass tinted skyscraper, the Canwest Place building, stands in the background. Three flags stand in the background of the sculpture. Bronze sculpture of caribous crossing a river, titled "Seal River Crossing" outside the Richardson Building with the Canwest Place building in the background, City of Winnipeg, Manitoba, Canada.